Portable instrument for measurement of relative humidity-Wet & Dry Mercury lled (Replaceable) yellow back lens type glass thermometers. Mounted in Natural wooden frame, and handle. We are occupied in providing an extensive gamut of Digital Laboratory Thermometer. Chemical Thermometers, mercury filled 30cm. long , accuracy +1 division , made from imported capillary , screen printed graduation. Advanced Technocracy Inc. is Manufacturer, Exporter & Supplier of Laboratory Thermometers. Chemical Thermometer, made from Superior quality glass with prominent mercury column most accurate for Research Laboratories. Length of each Thermometer are 30cm in following range: 50 C 1/1, 110 C 1/1, 100 C 1/2, 150 C 1/1, 250 C 1/1, 360 C 1/1, 400 C 2/1, 220 F 1/1 and 400 F 2/1. Chemical Thermometer, made form Superior quality glass with prominent mercury column most accurate for Research Laboratories. Length of each Thermometer are 30cm in following range: 50 C 1/1, 50 C 112, 110 Q 1/1, 110 C 112, 150 C 1/1, 250 C 1/1, 360 C 111 , 400 C 211, 220 F 1/1 and 400 F 2/1. 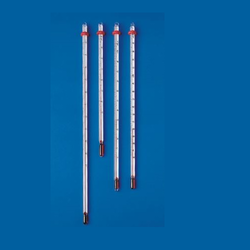 Our customers can avail from us a wide range of Maximum Minimum Thermometers. Suitable for meteorological purpose, these are used for measuring maximum and minimum environment temperatures. These prove very beneficial for weather forecast, due to which finds huge applications. Our customers can purchase these thermometers at market leading prices. It is used to measure temperature in educational laboratories.